In BY SIDNEY LUMET, the director ponders the moral message that permeated his body of work. Photo courtesy Augusta Films. Lumet died in 2011; but, in 2008, he sat for five days of interviews with producer Thane Rosenbaum and the late filmmaker Daniel Anker for American Masters. Those interviews frame filmmaker Nancy Buirski’s latest film, American Masters: By Sidney Lumet. Following its world premiere at the Cannes Film Festival and brief theatrical release in Fall 2016, the film makes its national broadcast debut on PBS tonight, Tuesday, January 3, 2017, 8:00 – 10:00 p.m., ET, launching Season 31 of American Masters. Check local listings for air times and repeat broadcasts in your region and its availability on digital video On Demand and DVD/Blu-ray from FilmRise. 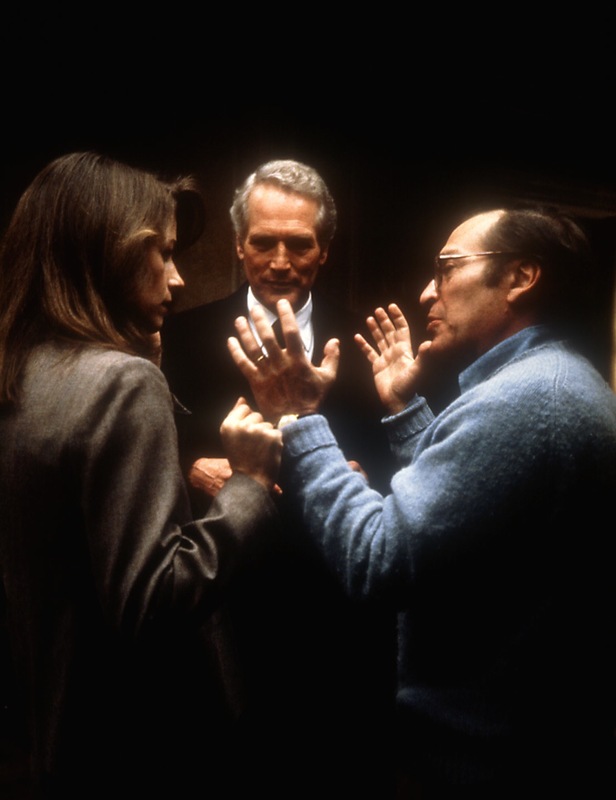 Sidney Lumet directing Charlotte Rampling and Paul Newman in THE VERDICT in 1982. Photo courtesy ©Everett Collection. If you’re a fan of 12 Angry Men, Serpico, Dog Day Afternoon, Network, Long Day’s Journey into Night, The Pawnbroker, Running on Empty, The Verdict and Murder on the Orient Express, to name just a few of the 44 feature films that Sidney Lumet adapted and directed over a period of 50 years, I urge you not to miss American Masters: By Sidney Lumet. Primarily known for his serious body of work as a film director (his feature films received an incredible 46 Academy Award® nominations and six wins, including an Honorary Oscar in 2007), Sidney Lumet shares some fascinating anecdotes about his surprising success as a working child actor in New York’s Yiddish Theater, as well as on Broadway and in film, the latter in small roles. He credits Henry Fonda and luck with his trouble-free segue from TV to film directing, but it’s clear that Lumet’s longevity in show business is due to the lessons learned from his dad. Noted Yiddish stage actor Baruch Lumet instilled in his young son a reverence for his theater milieu, classic drama and the virtues of hard work and a regular paycheck. During the opening and closing minutes of By Sidney Lumet, the director ruminates on the life and career-altering ramifications of a shocking incident he witnessed and chose to ignore in Calcutta as a young man. He also revisits the father-son dynamic that enabled his family of poor working actors to survive on Manhattan’s Lower East Side during the Great Depression, as well as his personal challenges during the McCarthy era of the 1950s. 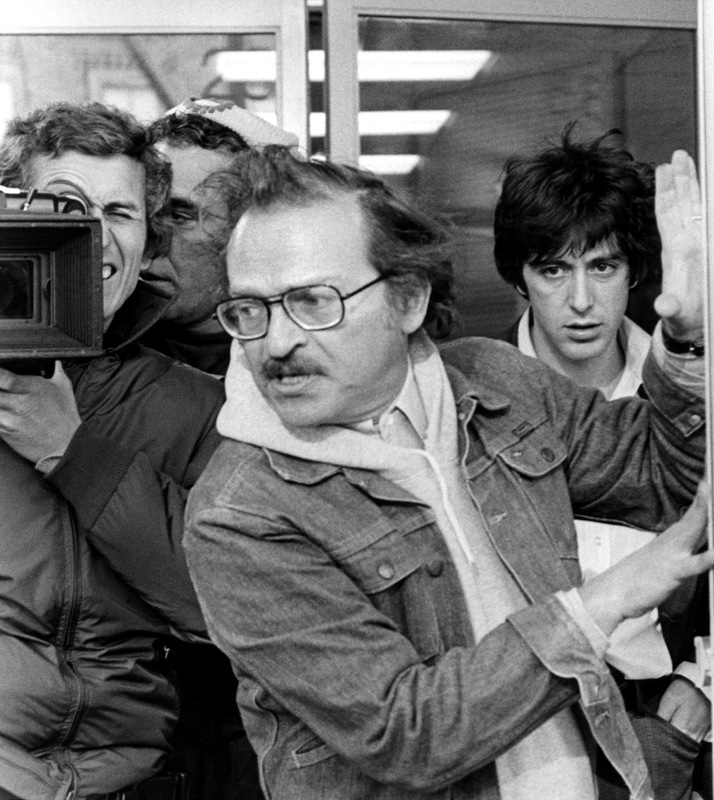 Sidney Lumet (front) and Al Pacino (far right) filming DOG DAY AFTERNOON in 1975. Photo courtesy ©Everett Collection. The clips not only remind us of some of the most outstanding film and TV dramas of the last half of the 20th century but some of the greatest film and stage actors to grace the screen as well. Hepburn, Brando, Fonda, Steiger, Newman, Pacino, Richardson, Magnani, Bacall, Hiller, Redgrave, Robards …the list of brilliant actors featured in large and small roles in Lumet’s projects is endless. Lumet seemed to draw these giants to his side like a magnet. 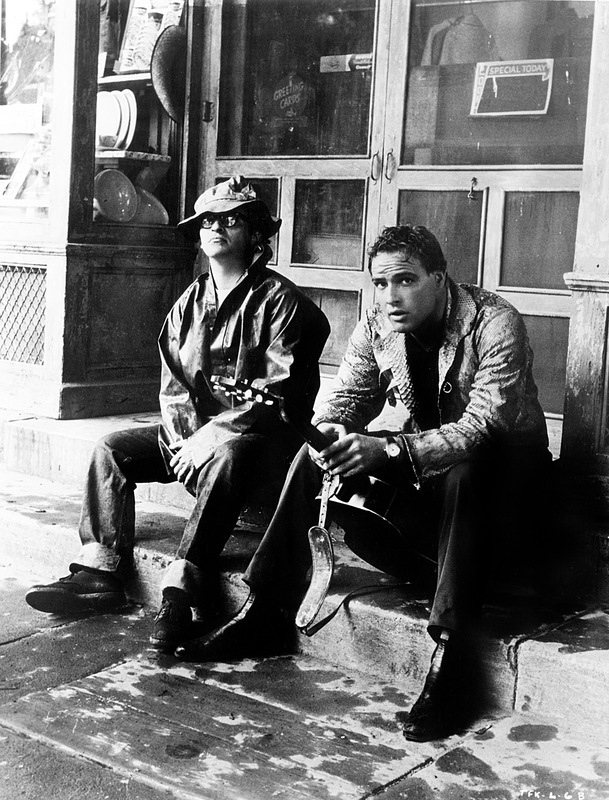 Sidney Lumet (left) and Marlon Brando kick back on the set of THE FUGITIVE KIND circa 1959. Photo courtesy ©Everett Collection. American Masters: By Sidney Lumet refreshingly steers clear of bombastic anecdotes from Hollywood cronies and details of Lumet’s personal life, loves and losses as an adult. Ms. Buirski allows Lumet and the film and vintage TV clips and photos to speak for themselves. His themes consistently explore the moral dilemmas facing responsible individuals in their communities, families and workplace and are still relevant and timely. One wonders how Lumet would have addressed the current American political climate and mindset were he alive today. This entry was posted in Film, Theater, Theatre, TV and tagged 12 Angry Men, American Masters, Baruch Lumet, By Sidney Lumet, Daniel Anker, Film Directors, Nancy Buirski, Sidney Lumet, Thane Rosenbaum, Treat Williams, Yiddish Theatre. Bookmark the permalink. Thanks for this review. 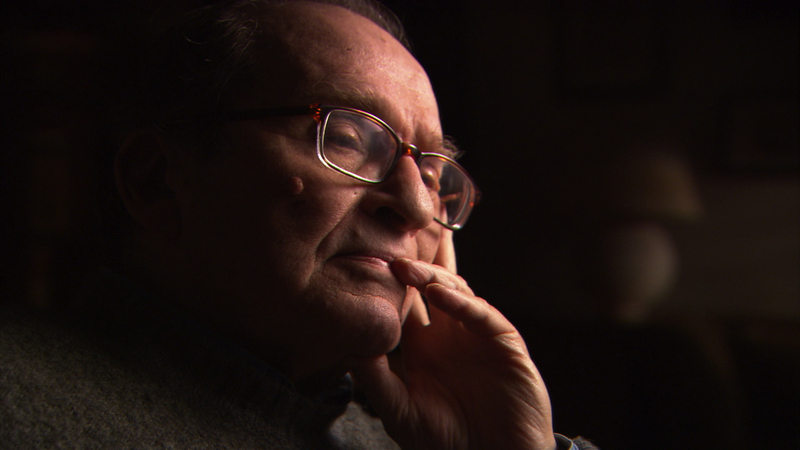 “By Sidney Lumet” is one of the best documentaries I saw last year. It lets him speak for himself without a lot of talking head comments. It’s a bit unusual in the way it uses film clips to illustrate his comments. Most of the clips here are allowed to run longer than we’re used to, which gives them time to breathe and gives the audience a deeper sense of the context. Nancy Buirski also made “The Loving Story,” which is the basis for Jeff Nichols’ film “Loving.” She does good work. Thanks for drawing attention to this fine film. Thanks so much, Ted! I wholeheartedly agree with everything you said! Nancy Buirski is also a producer of the feature film, LOVING, as well.